Roots Vacuum Pump for Vacuum Casting- Vacuum Pump - EVP Vacuum Solution! 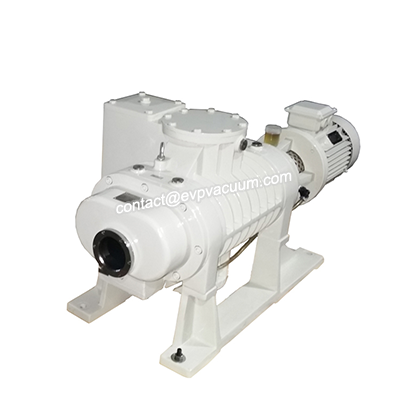 Roots vacuum pump is a kind of rotary volume vacuum pump. Its structure is evolved from Roots blower. According to the different working pressure range of Roots vacuum pump, it can be divided into low vacuum Roots pump, medium vacuum Roots pump and high vacuum multistage Roots pump. Roots vacuum pump has been widely used in smelting, vacuum casting, petrochemical, electrical, electronic and other industries. Today I will talk about the benefits of Roots Vacuum Pump in Vacuum Casting. Vacuum casting is a process using ventilated mould. The molten metal flows into the mould by air pressure, and then clears the air to form a vacuum. This casting method is mainly used for small parts or jewelry with exquisite details. 1. Moderate vacuum, high compactness of cavity and high quality of castings. 2. Vacuum casting with computer simulation of mold flow analysis can predict the production of casting defects. For the design of the mold scheme, it can greatly save time and improve production efficiency. Vacuum casting can be roughly divided into vacuum suction casting, vacuum low pressure casting and vacuum differential pressure casting. (1) Vacuum suction casting is conducive to the removal of gas in the casting mould, restraining turbulence and entrainment, overcoming the disadvantages of low pressure casting and differential pressure casting, and improving the filling capacity of liquid metal. (2) Due to the improvement of filling capacity in vacuum suction casting, the casting temperature of molten metal can be 20-30 C lower than that in gravity casting. (3) Castings with different wall thickness, thin wall and high quality requirements can be cast. (4) By choosing the appropriate rate of vacuum change and controlling the speed of liquid metal entering the cavity, a stable filling effect can be obtained. (1) The existence of vacuum negative pressure can make the mould sand compact and increase the strength of the mould. (2) Moderately increasing the vacuum, shortening the filling time, not only accelerating the filling speed, but also stable. (3) Vacuum low pressure casting can accelerate the fluidity of aluminium alloy at low temperature, avoid the phenomenon of air absorption of aluminium alloy cast at high temperature, and increase the pinhole defect of the casting. (4) The castings have good formability, which is conducive to the formation of clear contour and smooth surface castings and large thin-walled castings. (5) The casting has compact structure and high mechanical properties. (6) In general, no riser is needed, which greatly improves the yield of liquid metal, usually up to 90%. (7) Good working environment and simple equipment are conducive to mechanization and automation. (1) Compared with traditional gravity casting and vacuum suction casting, vacuum differential pressure casting has a good filling capacity on 1 mm thick sheet specimens. (2) The castings have compact crystalline structure and mechanical properties. The strength and elongation of the castings are increased by 20%~25% and 50% respectively compared with vacuum suction casting and gravity casting. (3) Vacuum die casting can effectively reduce the porosity of die castings and increase the density of castings by more than 1%.